When I first saw it I was a bit surprised. At first I thought I had set up some kind of alert. But I didn’t. Then I thought it must have been something which was there before, but I just hadn’t noticed it. It wasn’t, it is brand new. Facebook has released a new feature which I personally feel is a smart move and a nice one, something worth competing with Google Plus. And something which can drive traffic. 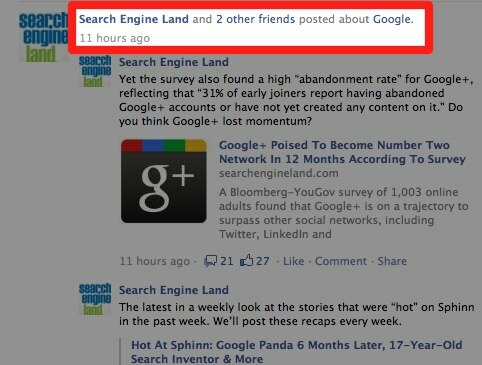 Facebook now shows you links to a Facebook Page when multiple friends post updates have mentioned that specific page. At the same time we are going to see some changes to the like button. In Gmail you have ads, those are based on what you write in your e-mails. Facebook is using a similar kind of technique. It uses natural language processing on status updates to find out what names are mentioned among friends. It then determines which of the topics mentioned are trending with those friends, look at your interests and posts, and then it will show you those topics. The names of the pages are recognized both in text (content and headlines) and links. A second way of recognizing pages is tags. Tagging a specific page will therefore become a lot more important. The thing which Facebook cannot figure out however is sentiment, so it could be that you are seeing stuff people don’t like, but mention anyway. The feature in this time and age also might raise some privacy questions. Some users might not like the idea that Facebook is ‘reading’ your posts to figure out which updates they should highlight. It is the same discussion which was going on with Gmail. And it has the same answer: it is not Facebook – people reading your posts, its a machine. Still, it might hold back some people of using brand names. Personally I feel the Facebook Stories feature in which you can appear in ads is a lot worse. “Posted About news feed stories” as they are called are very interesting for marketing purposes. Your Facebook Page can benefit from this. A lot. The more you get mentioned the more traffic it will deliver you. The blocks of content are so big they can hardly be missed and if more people share a page you are more tempted to click on it. It means that marketers will start trying to push their brand names into titles, links and texts so that whenever an article is shared it might have a chance of showing up. Is this a response to Google+? It looks like this might be a direct response to Google+, which with Sparks tries to push content and which shows you content which more people within you circles have shared. Even though it looks like a response to this, it is not. Facebook has been doing stuff like this for a while and has been testing similar types of aggregated news stories for a while. But to be honest: it is an ad-on which can compete with Google+ features. I like it, how about you? @Bas – “Facebook is pulling a Gmail” 🙂 Couldn’t have put it any better! Displaying ads based on what you write/status updates… Clever. But I also see there being an issue with relevancy because bots can’t detect sarcasm or “inside jokes” and therefor could serve up irrelevant ads etc..